In virtually every scene where Buddy the Elf (Quinn VanAntwerp) appears in Pioneer Theatre Company’s production of Elf: The Musical, he towers over the other cast members—literally, as in he appears to be ridiculously taller than not just his adopted elf family at the North Pole, but also every other human. That’s a wonderful bit of visual emphasis for a story that originally became popular as a vehicle for Will Ferrell, but VanAntwerp isn’t trying to mimic Ferrell here. He and director Dan Knechtges simply understand that what makes this tale charming is a character with a personality bigger than the world around him. The musical version—adapted from the 2003 film by writers Thomas Meehan and Bob Martin and songwriters Matthew Sklar and Chad Beguelin (the stage version of The Wedding Singer)—stick reasonably close to the movie’s story of Buddy’s trip to New York City to meet the human dad, Walter (Martin Vidnovic), he never knew he had. And while the play drops the subplot about a surly, diminutive children’s-book author brought in to help publishing-company exec Walter with a crisis, the focus is still on Walter’s workaholic lack of connection with his wife (Tanesha Gary) and 12-year-old son (Jaedin Clark). Sklar and Beguelin’s songs aren’t exactly a knockout bunch, though the kickoff number, “Happy All the Time,” is an energetic standout, and the second-act opener “Nobody Cares About Santa” provides a great opportunity for a bunch of grizzled retail-store Santas to perform a Rockettes-style kick-line. Many of the others feel like plot-advancing filler, leaving few tunes that you’ll be humming on the way out of the theater, even after the reprises. 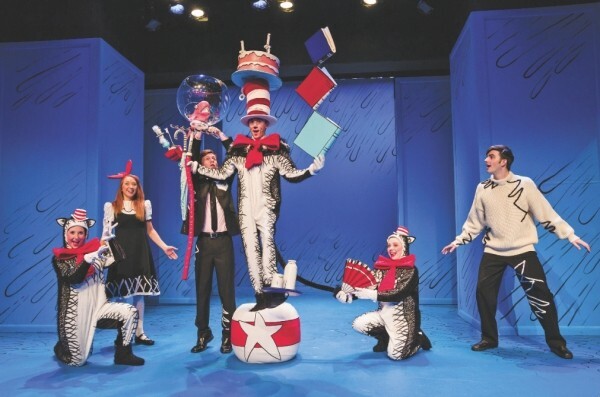 Borrowing liberally from Freudian theories of the psyche, Jungian archetypes and a Taoist belief in the necessity of balance between order and chaos, Salt Lake Acting Company’s production of The Cat in the Hat—originally adapted by Katie Mitchell of the National Theatre of Great Britain from the original source material by Theodore “Dr. Suess” Geisel—is a delightful romp across ancient Eastern and Modern Western thought that’s fun for the whole family. Tongue-in-cheek analysis aside, this show is definitely worth seeing. Director Penelope Caywood, returning for her fourth children’s show at SLAC, brings Dr. Suess’ beloved reading primer about two bored kids on a rainy day (Luke Monday and Elena Dern) who get an unexpected visit from a troublesome cat (Austin Archer) to life with delightful flair. The set and props—constructed by the Seattle Children’s Theatre—lend an appropriately surreal Suessian quality to the production. The costumes (by Brenda Van der Wiel) maintain hashmarks indicative of the kind doctor’s inkwork. A far cry from the big-screen big-budget 2003 abomination starring Mike Myers, this show honors the tone, spirit and text of the storybook, while adding just the right technical touches to justify bringing it to the stage. If it ain’t broke, right? Each and every performance is pitch-perfect, and Caywood’s masterful direction allows a sincere wackiness that never once overplays a moment or inserts an easy gag. Archer’s Cat in particular captures the fun of the character without leaving out what I can most easily describe as his creepiness. He is neither hero nor villain—merely chaotic Id personified. Also worth noting is the story’s moral center. Portrayed as a puppet attached to an undisguised man in evening wear, the Fish (Jaten Mcgriff) simultaneously blurs and acknowledges the line between puppet and puppeteer. It works.